The second day may be “only” four to five hours worth of walking, but it’s not a short day. The trail is very steep today and they will take many breaks. Once they reach the first major ridge, they leave the forest behind and enter the moorland with its giant heathers as they work their way up towards the Shira Plateau. There are a couple more steep ridges, offering great views, and a descent in the valley on the other side. Eventually, some time after lunch, the path flattens out. (Did I mention the path is steep?) 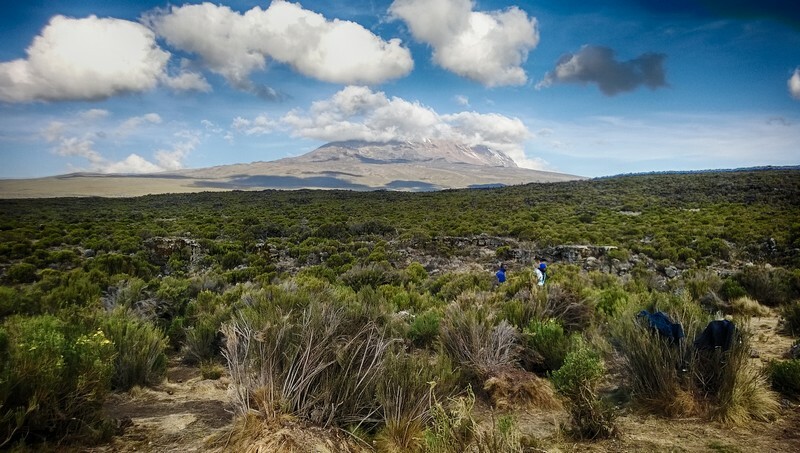 They will be standing on the edge of the Shira Plateau at 3612 m (11840 ft): with Kibo straight ahead, the Shira Ridge to their right and they will be overlooking the plateau below. Yes, below. It’s all downhill from here. Their next camp, Shira I, is at 3480 m (11420 ft). Many climbers say that this is their favorite day of the walk. If you’re wondering how I know all of this when I haven’t heard from them; its because I have researched the route. I did speak to them last night (Face Time is amazing!) while they were eating breakfast about to leave for the mountain, but since then I haven’t heard from them. I will continue to update with general information about what that day’s climb is expected to be and will let you know when I hear specifics from them. I can tell you that they are really ready and excited and already the fellas are looking scruffy with their growing beards. As I write this, they are asleep and therefore this update is really what they expect to do tonight while we are sleeping. Make sense? No? That’s ok. Just remember they are 9 hours ahead of us.